America’s competitive advantage is its workforce. Our Health Means Business Champions tell us that company wellness is a competitive differentiator, enabling them to recruit the best and brightest talent, as well as to create a fun and productive work culture. The CEO pledge is a national campaign promoted by the National Coalition for Promoting Physical Activity to encourage every CEO in the United States to recognize physical activity as an important driver of employee health and business performance. Best practices from our Champions Network have demonstrated that if the CEO leads the way, employees are likely to be more deeply engaged in wellness and physical activity programming at work. A wellness committee is a group of people who will develop, promote and lead the company workforce involvement in health and wellness activities. The committee also helps to choose and direct company activities in the community. A committee that includes a diverse set of employee members ensures engagement, relevance and continuity. One of the most fun aspects of joining a wellness committee is the opportunity to brainstorm big ideas for how to improve health and wellness at a worksite and in your community, from creating yoga classes to hosting a local farmers market or volunteering at the local food bank. What if you held your next team meeting outdoors? Walking stimulates brain activity, lessens stress and leads to greater health. Our Health Means Business Champions tell us that walking meetings lead to greater team cohesiveness, energy and creativity. Being out in the community walking also inspires other businesses to follow your company's lead. Next time you want to energize your team and lead by example, pass up the doughnuts and take a walk instead. Healthy snacks seem obvious, but remember to consider healthy alternatives to the candy at the reception desk or the snack machine in the breakroom. Try substituting fresh fruit for candy, or add a healthy snack machine to broaden the choices beyond the usual chips, gum and pretzels. 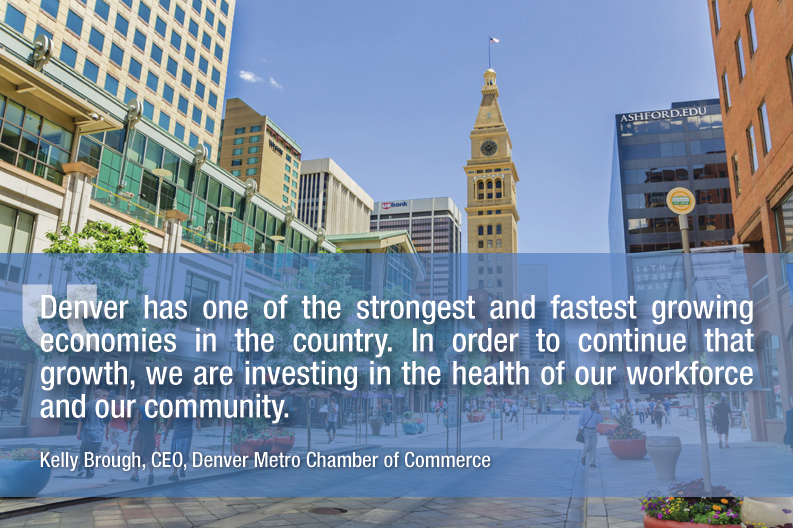 One of our favorite tips, called the Summit Club, came from the Denver Metro Chamber of Commerce. The team measured the height of their staircases and figured out how many stairs they could climb in order to equal a Colorado mountain summit (14,000 feet). When someone climbs the stairs often enough to reach the "summit," they join the Summit Club. The Denver Metro Chamber team reports that they have several employees who have summitted multiple times. Before starting this club, the Chamber cleaned up their stairwells and even opened up a staircase in between two of their floors in a renovation to make it even more attractive to use. What fun idea will motivate your employees to take the stairs? Want more ideas? Check out our Fast Tracks for quick tips to increase health! I want to join the movement to help businesses drive community wellness! Thank you for helping to build a healthier business community. Attend the 2017 National Summit. Registration Now Open!